I have been invited by the school leadership to be a member of the Turnaround Schools support team for the district. It has several layers, and is very difficult work. At the first meeting with educators of the four schools, district administration, and other stakeholders there was a principal there, whom I recognized but just couldn’t figure out how I knew her. So, during a break, I asked one of the assistant superintendents, “Who is that?” When she told me the name, my mouth dropped open in utter shock. “Is she alright?” I asked. “What’s happened to her?” The response startled me almost as much as seeing this young woman in this state. I was told “loose living” is taking its toll on her. I hadn’t heard any one use that expression in a long time. But it’s a term that makes sense. “Loose living” typically implies immorality, but I think it has a deeper and more significant meaning. The term describes someone whose character is weak, and probably, whose relationships are superficial. It implies that person’s life style does not reflect a wholesome value system. In this case, we were looking at a professional who is responsible for the education and development of children in an elementary school. She apparently was not guided by the values of her profession, but rather controlled by other needs or circumstances. Across the lake from Galilee, where Jesus had been teaching, was the region of the Gadarenes. Jesus took a boat with his disciples and as they stepped out a wild man, buck naked, ran towards Jesus, screaming and ranting. The people caring for that man were doing the best they could. Back then, the most humane way to treat him was to keep him from hurting himself, or, from hurting others. So they kept that man chained up, and assigned someone to guard him or watch over him. But when he was wild with his rage, he could break the chains and he would run to the outskirts of the city and he would live where the tombs were kept, desolate and separated. “Who are you?” Jesus asked him. The man replied, “I am legion, for we are many.” At that time a legion was a Roman military unit of 5,000 to 6,000 soldiers. This suffering man was possessed with many demons. The concept of being possessed by demons has reentered the world of intellectual thought. We use the word demons to describe the process that pulls people apart. We are told “to face our demons” and to rid our lives of them. There are demons from our past that need to be exorcised. Then there are the demons that control us and tear us away from experiencing a peaceful life. They are the demons of jealousy and hate. The demons of greed, guilt, revenge and resentment make a peaceful life impossible for those afflicted and even for those people who live and work with them. A new demon has appeared in our times. That is the demon of winning and being first. This demon has assumed godly proportions in our culture. It can take the form of winning by getting rich through deviousness and dishonesty, or, winning the first place in contests or in everyday life whether driving on the road, or going through a doorway at the shopping center. In these modern times, we are often surrounded by people possessed just as much today as when Jesus walked through the region of the Gadarenes. Some of these people are possessed by the demons of lust, greed and ambition. This condition makes them unable to connect to the people around them. They are shackled and chained by the choices they make living lives that resemble desolate tombs that offer no love or comfort or consolation. Just like the man Jesus encountered, these modern demoniacs feel no or little connection to others. These people are unable to focus on the aspects of life that are good and holy that will bring the best that life has to offer into our own lives and into our world. Just like the demoniac in today’s Gospel, these people see Christ as a threat. They cannot stand to be near Him or let Him into their minds or hearts. Nor can they serve Him. These people are fragmented and torn apart. They easily harm themselves and us. 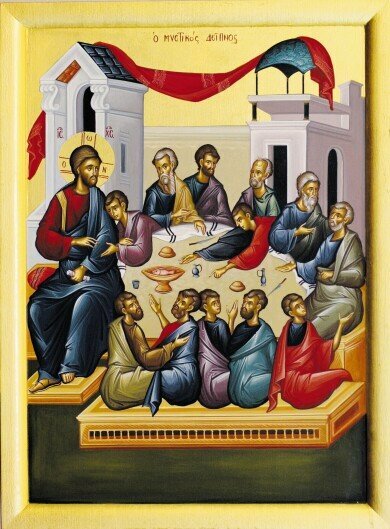 Whether we are considering the man living in the tombs from today’s Gospel reading, or we are thinking of ourselves and others like us, who come to worship at the Divine Liturgy on Sunday morning, the problem is the same. If we suffer from divided hearts, divided allegiances, or divided values, we will experience misery and a lack of peace and calm. It is necessary that all of us exorcise whatever demons influence us. We need to turn to Jesus Christ, so that we will not be pulled apart, but will feel integrated and feel whole. Like the demoniac we must surrender ourselves to God. We need to sit at the feet of Jesus and listen to His message. Christ our Lord, and the Church that He created for us, will pull us together so that we can defend ourselves from the demons that surround us and live a life filled with joy and serenity.